Only the best of modern comfort resides in a stay at Courtyard Boston Stoughton. Our modern hotel will have you situated near Stonehill College, South Shore Plaza and the neighboring Town of Braintree. You can also enjoy access to Randolph and Boston, Massachusetts. Following a day of making memories, come home to our spacious rooms and suites equipped with complimentary Wi-Fi, comfortable bedding and ergonomic workstations. In the mornings, you can wake up to the smell of fresh food and Starbucks coffee at The Bistro. When it's time to wind down in the evening, return for classic American cuisine and hand-crafted cocktails. For something quick, stop by our 24-hour Market at anytime. To round out your stay with us, we offer a 24-hour fitness center and a heated indoor pool. 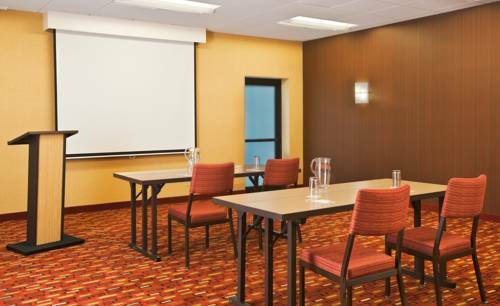 If you're traveling here on business, host a board meeting in one of our two event spaces. Each event is made better with our catering options and AV equipment. Get ready for a relaxing stay at Courtyard Boston Stoughton.